Fully wallpapered rooms are the latest fashion in interior decoration. Hence, there are several shades, patterns, and textures of wallpapers available in today’s market. The modern digital technologies enable people to customize images and print them into cost-effective wallpapers. The usage of wallpapers lasts for many years too. People prefer using home wallpaper to painting the walls that require maintenance within 3-5 years. Wallpaper usage is more durable than painting. 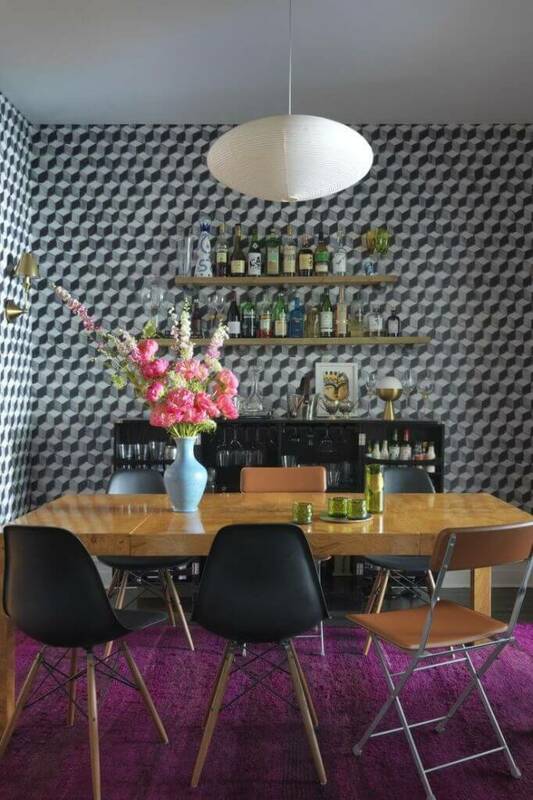 In the informal dining room, you can use geometric patterned home wallpaper design on all four walls. The geometric patterned design is 3-dimensioned cuboids that stand out from the planar surface. The colors of the cuboids are grey. One face of the cuboids is colored with one face jet black. The furniture including dining chairs and side-board are colored black. The other furniture including dining table and chairs are brown. The two shelves above the black sideboard are brown. The color of the ceiling is grey. This could be due to using plain grey colored wallpaper or plain grey colored paint. A lamp is allowed to hang from the grey ceiling. The floor is covered with a contrasting pink rug. The neutral colored wallpaper is designed with silver colored motifs on plain white colored wallpaper. This wallpaper is certainly ideal for covering all uneven walls of the bedroom in the attic with limited space. The chandler hangs from the center of the white ceiling. Decorate the room in white and grey or silver. For example, cover the bed with a grey blanket and white sheets. Use white lampshades for light on the dressing table. Also, use another white shaded reading light focusing above the white cushioned armchair. You can add another comfortable sofa. Leave a white rug on the big grey rug covering almost the entire floor. The unique pattern of this home wallpaper produces a dramatic effect wherever used. Here, the wallpaper covers the walls of an annexure room with an entrance. The demarcations of annexure room are very clear and stand out from the exhibition room. In the main hall for exhibitions, the narrowest wall can be utilized to hang the framed art-work. The art-work should blend in well against the background of the bold colored and patterned wallpaper. Below the hung art-work, a solid red colored low table can be placed. Also, place two grey colored vases of different sizes on the red table. The dark-colored wallpaper should have dark grey colored motifs against the light grey colored background. This dark shaded self-designed wallpaper creates a big impact, especially in this formal dining room. In order to increase the impact, add a mirror of considerable size on one of the walls. Use light grey colored paint to color the ceiling. Also, use plain white colored paint to color the border of the ceiling. From the grey ceiling, hang four small lamps providing dim light right above the dining table. The table should provide seating for six members. On the table place a basket of seasonal flowers. Use white colored covers for the chairs. The light wallpaper with circular designs made with light grey colored on white. This delicate wallpaper can work wonders on the walls of a room with bright interiors. You can use this wallpaper to cover all four walls. However, color the ceiling with a slightly darker shade of paint. Also, color the border of the ceiling with white colored paint. From the ceiling, hang a chandler. Hang matching grey and black curtains. Also, cover the entire floor with wall to wall with light Salmon pink colored carpet. Use the minimum furniture ensuring to avoid clustering. At the far end, place a double bed and cover the top with dark brown cover. Also, place cushions covered in brown and white. On both sides of the bed, place two side tables. On those, place white-shaded reading lamps and framed photographs. In front of the bed, place a sofa or reclining chair. On this white colored seat, place brown colored cushions for contrast. Opposite the bed, place a wooden table colored light salmon pink. On this place a vase full of roses the same color as table and carpet. Floral Patterns offer elegant touch especially to the little room of the house. Here, the designers used a soothing sea-green to color the background. Pastel shades of yellow and white create a beautiful design against this background. In this case, the ceiling is colored with mono-color – sea-green. This wallpaper resembles the forest full of winter trees with no leaves. The repeated pattern provides a harmony that is certainly pleasing to the eyes. Ideally, this sort of wallpaper should be used when the surrounding is neutral interiors. as shown here, you can use wallpapers to create accent walls or cover the wall behind the bed. Use white colored cover for the bed. On the bed, place two of each white and brown colored cushions and one black colored. Also, place two sets of drawers on either side of the bed. Place a reading light on one of the side tables. Color the ceiling with plain grey color and hang a spherical light. One can use various themes for interior decorations. The Oriental print for exotic or traditional look shows a room decorated like the Far East. The Chinoiserie print stands out against a light greenish background. There are birds flying and perched on flowering trees and fruit trees. The artwork depicted here is from China or Japan. This oriental wallpaper has made the living room look warm and harmonious. The ceiling has a solid greenish color and from it, there is an oriental lamp hanging. The room has several comfortable chairs and a sofa with a canopy. The furniture including tables and other items look they have been got from the Far East.